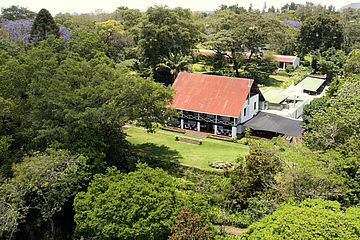 The Main house of the lodge was built in 1905, and it still retains many of the original features. 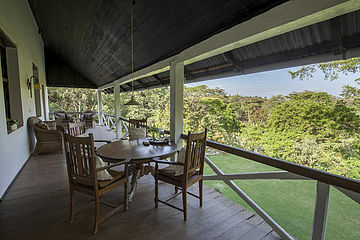 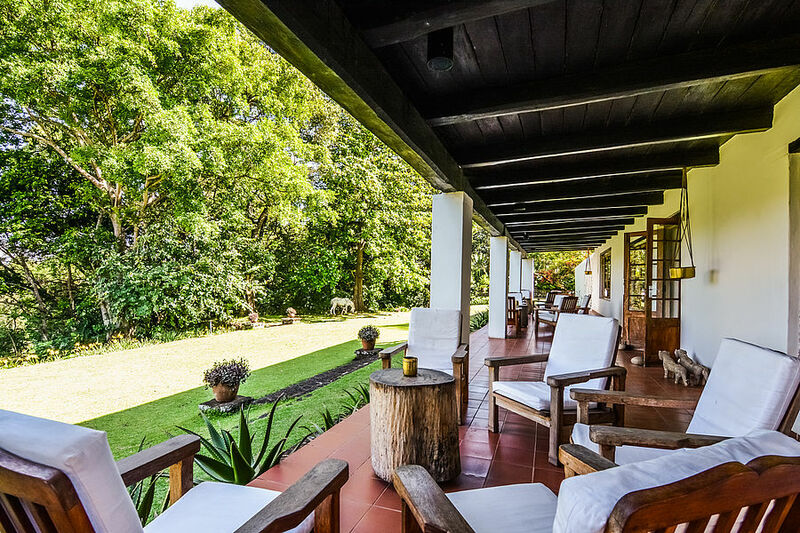 Long colonial verandas stretch along the front of the house. 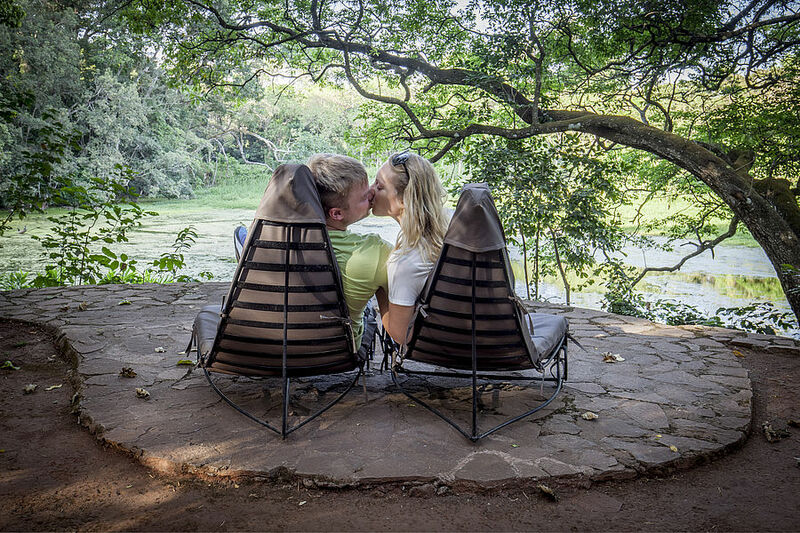 On the long armed chairs you can watch the lake, monkeys, forest. When the clouds clear up you can sit and admire the grandeur of Mount Kilimanjaro. We have a bar next to the reception as wells a a fireplace in the living room. 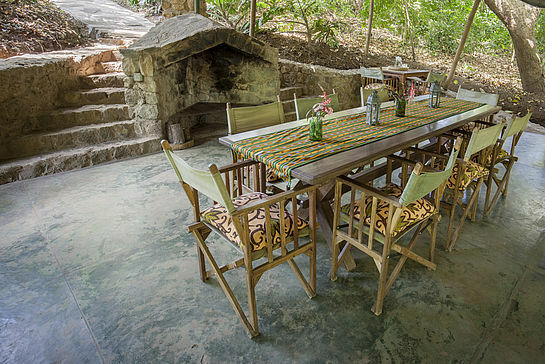 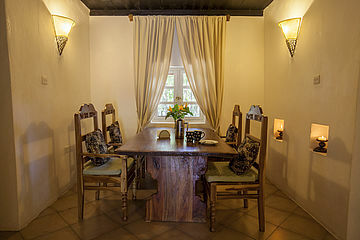 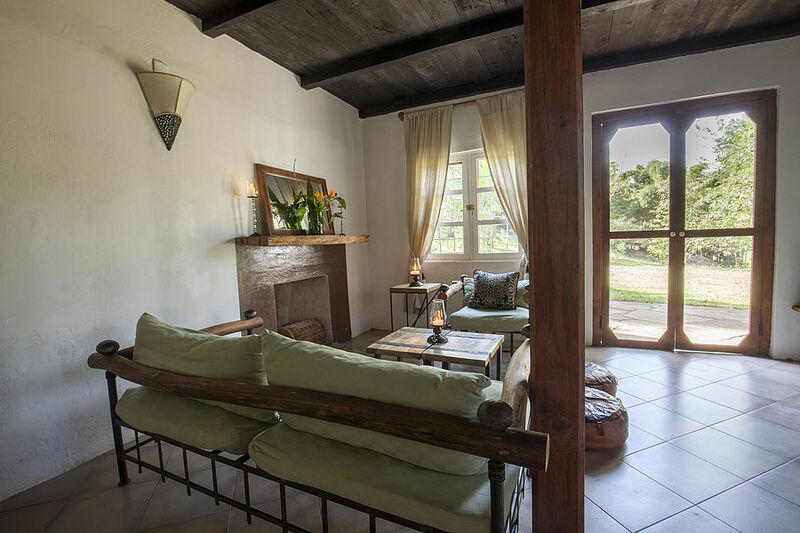 Furnished with stone benches and leather cushions, it is decorated with antiques commemorating Tanzania’s German colonial past. All meals can be served in three locations. 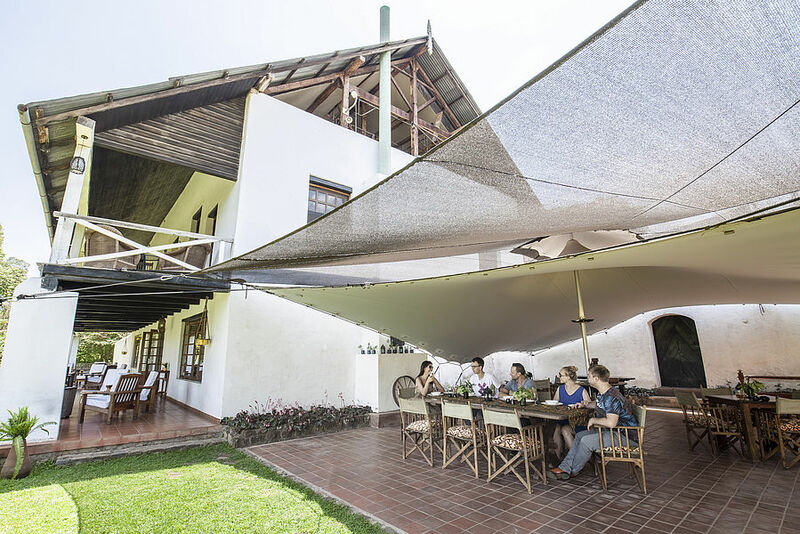 A dining room with an outside veranda, a tenticle dining area or a romantic lake pavilion. 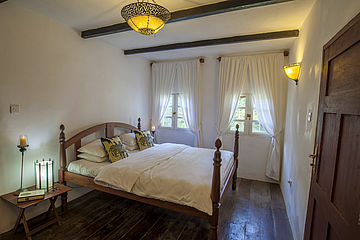 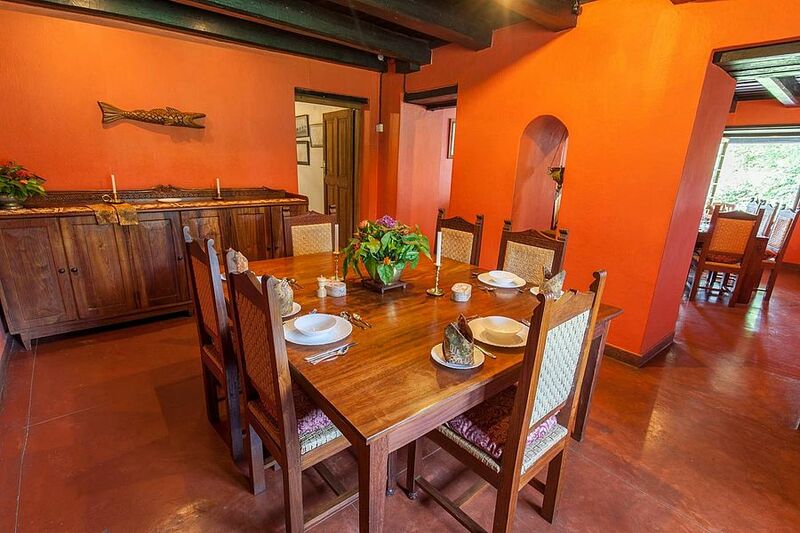 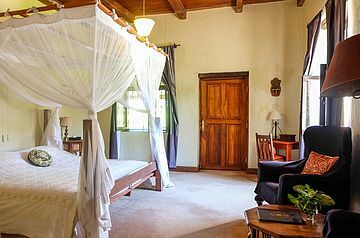 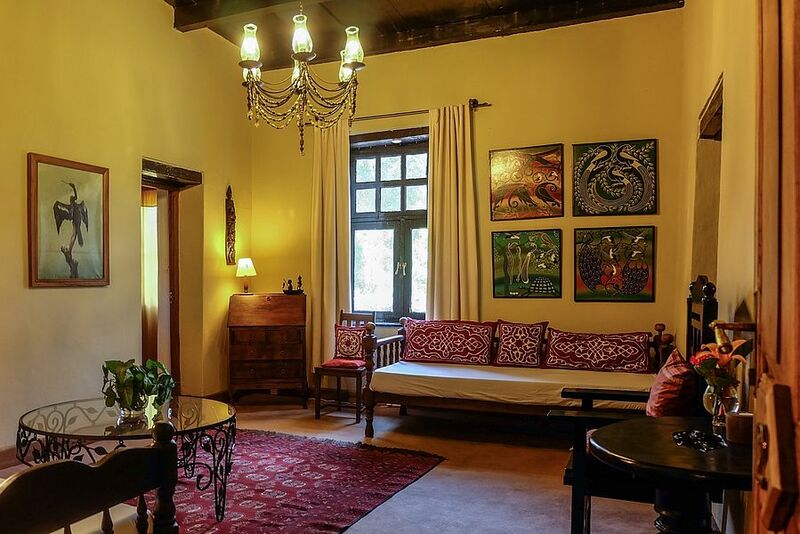 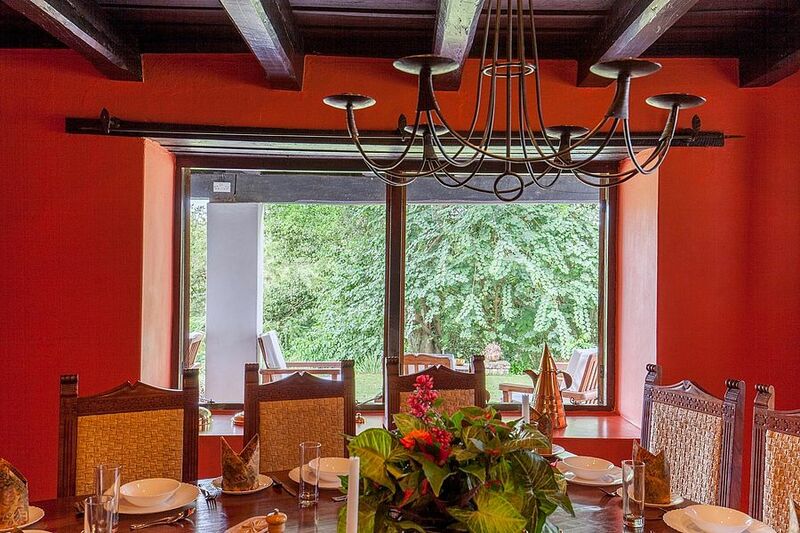 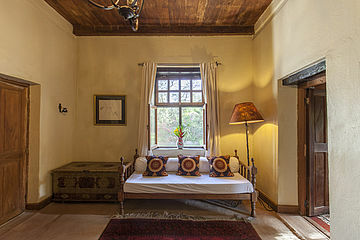 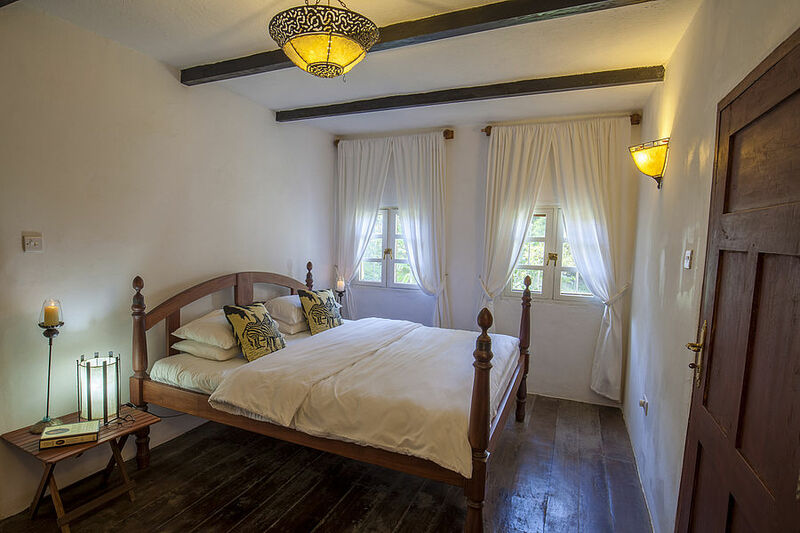 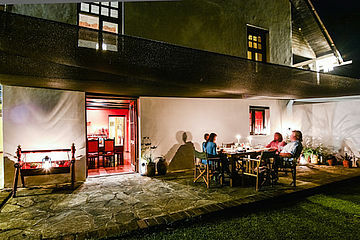 The Main House rooms are located on the first floor of the manor of Ngare Sero. Each room is equipped with a king-size double bed, a separate lounge area with large ottoman sofas that can be turned into single beds, and a spacious bath - and dressing room with bathtub. 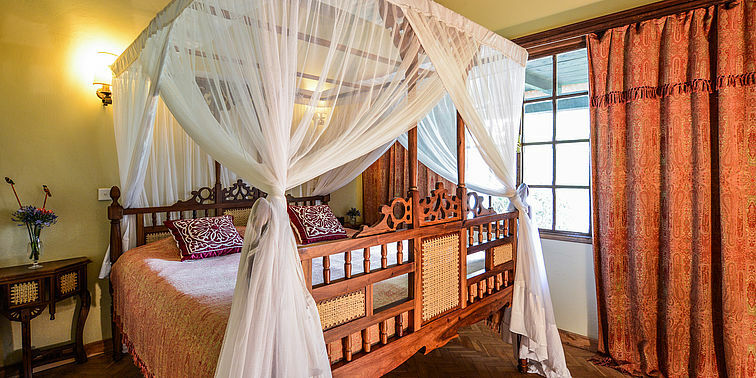 the generous veranda invites to lounge and enjoy spectacular views on Mount Kilimanjaro. Our 10 Garden rooms are nested in the tranquil gardens with the beautiful views of bougainvillea and jacaranda from private verandahs. 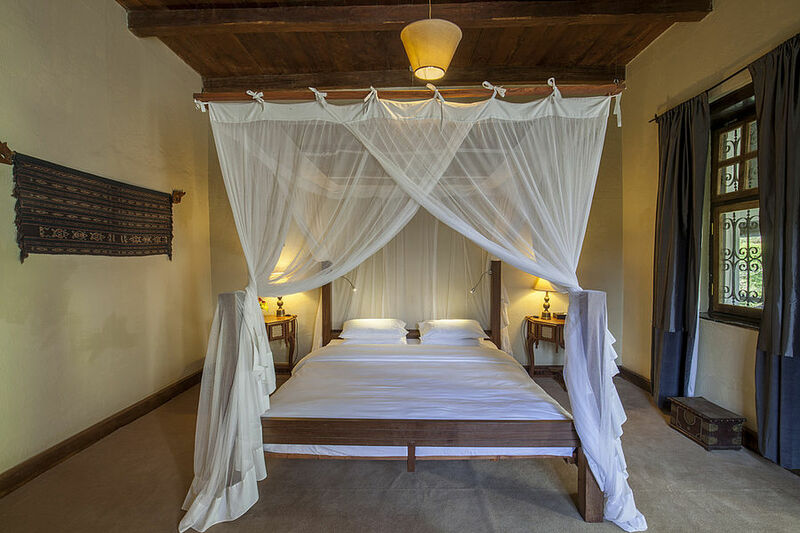 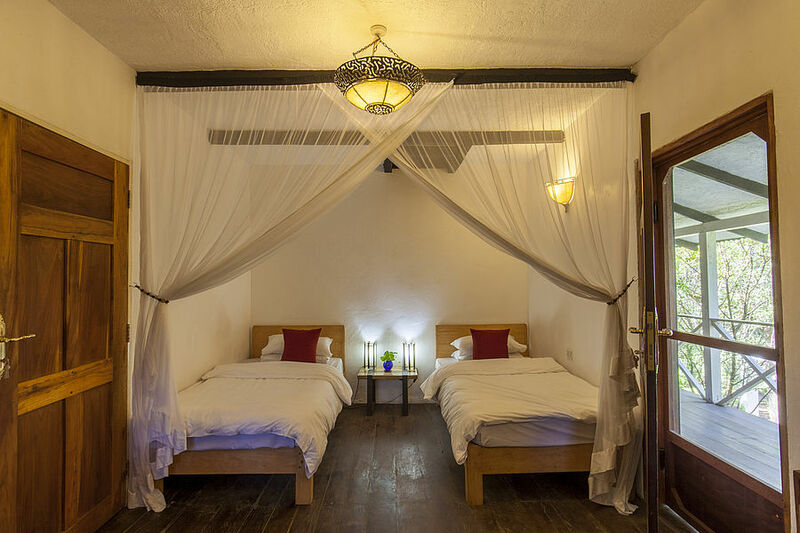 8 rooms offer king-size Zanzibar beds and 2 others are furnished with twin beds. 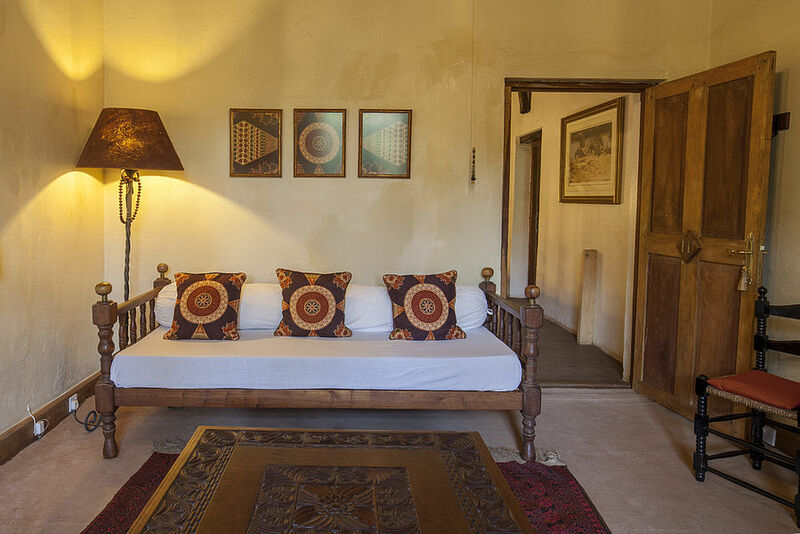 Interiors are individually decorated with ethnic fabrics and handmade furniture like study tables and the ottoman sofas that on request can be used as a third single bed. Each room has an en-suite toilet, a bath tub and a dressing room. 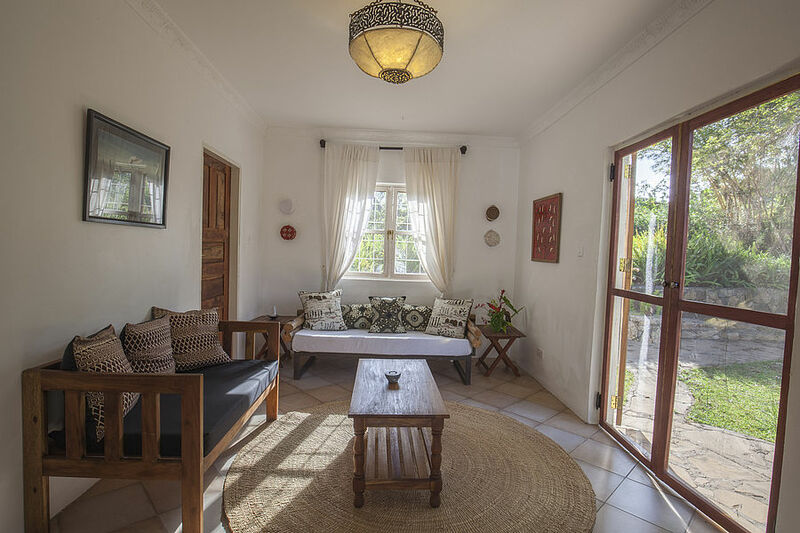 The Farm Cottage was built in the 50s, as a farm manager’s home and is now a private villa. Situated behind the garden rooms it is a three minute walk away form the main house. 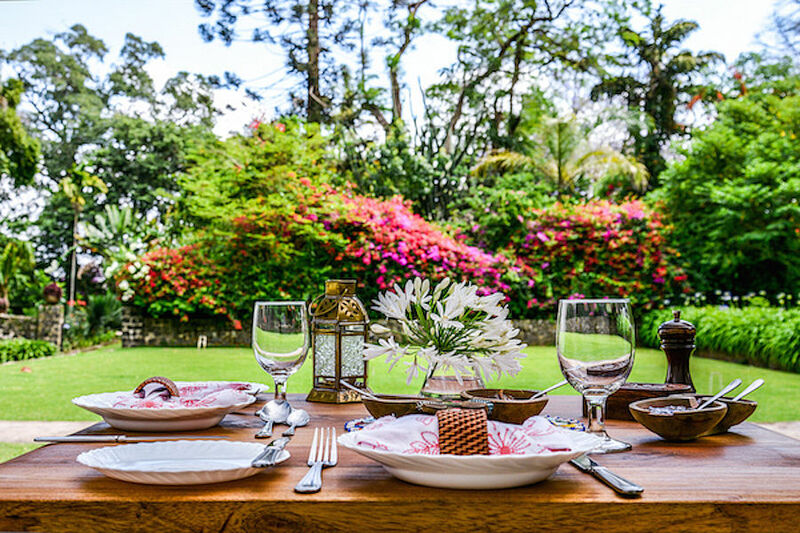 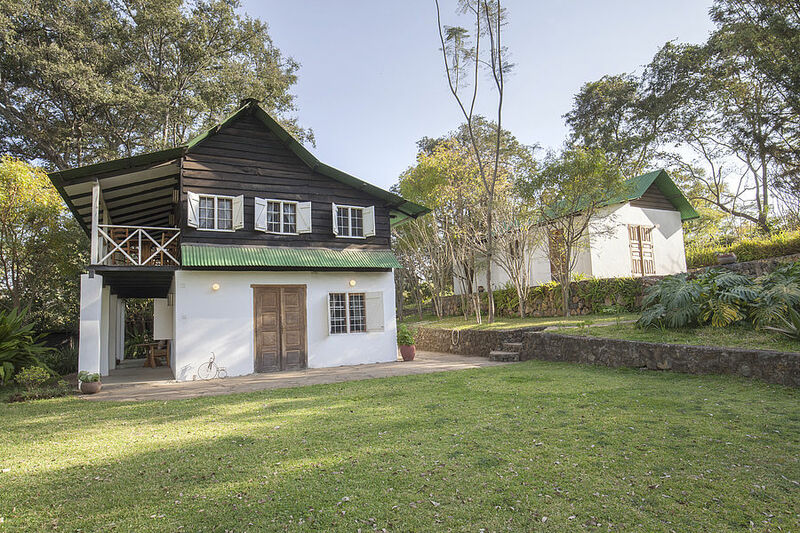 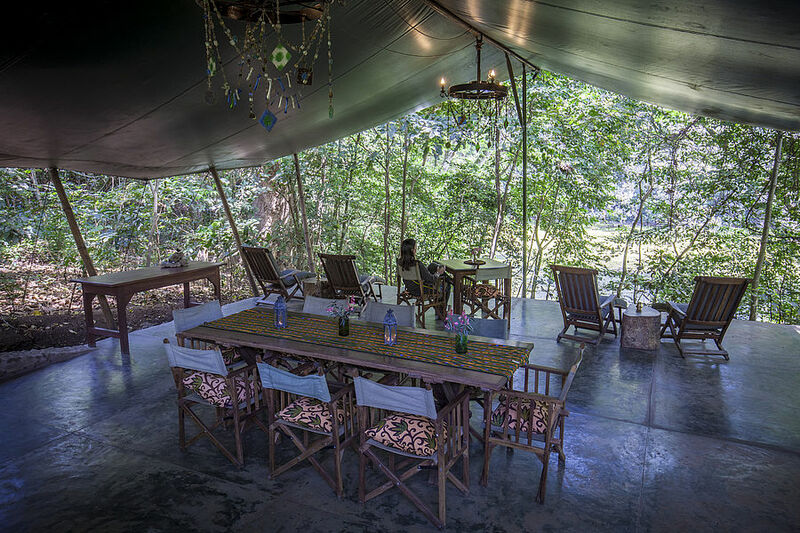 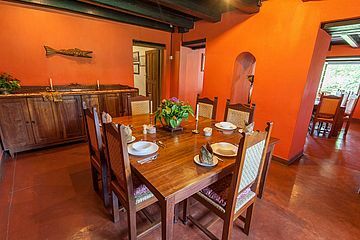 The main cottage is equipped with a state of the art kitchen, a living and a dining room, as well as a beautiful porch and balcony with a view of both Mount Meru and Kilimanjaro. 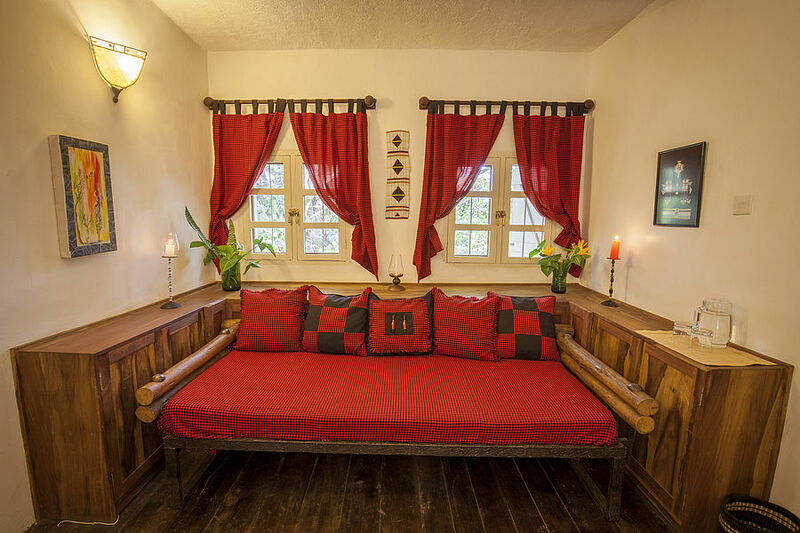 With its two bedrooms it can sleep 5 people. 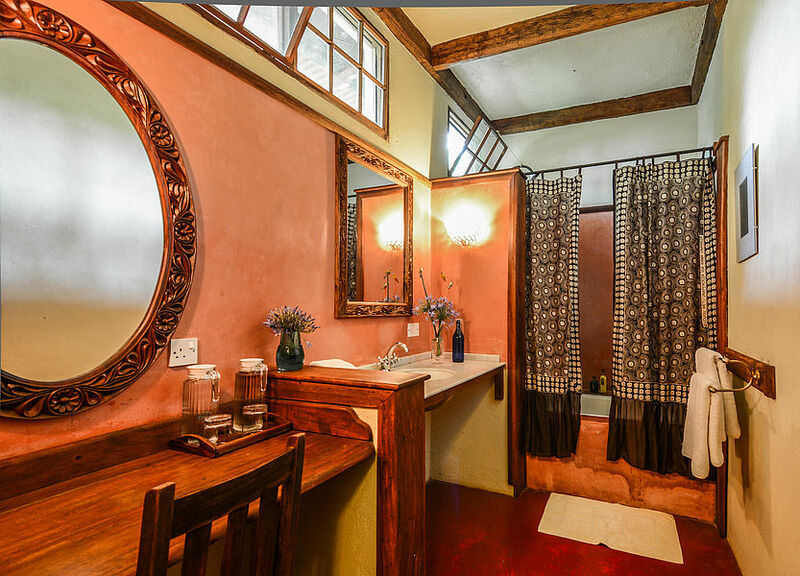 The ensuite bathroom of the master bedroom provides a spacious shower, whereas the second bathroom has a bathtub. 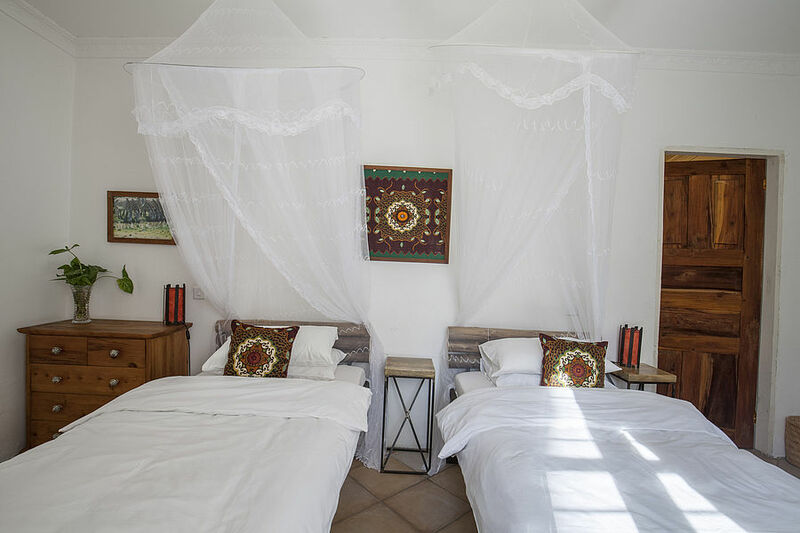 In addition to the main cottage there is a guest house which has a bedroom with two single beds, en-suite bathroom with a shower and a small living room. 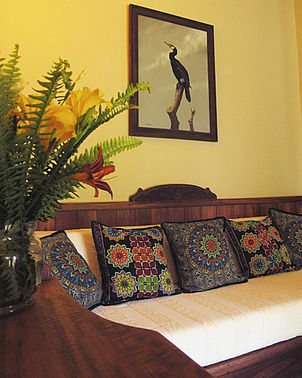 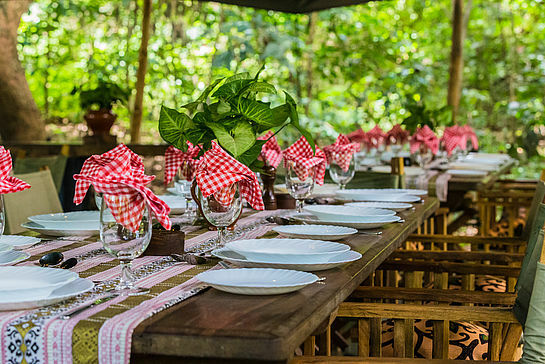 The lush tropical garden offers space and privacy which is perfect for a family with children. Delicious home cooked meals of hearty soups, freshly caught trout with homemade bread, pastry, local cheese and bundles of fresh herbs and salads. 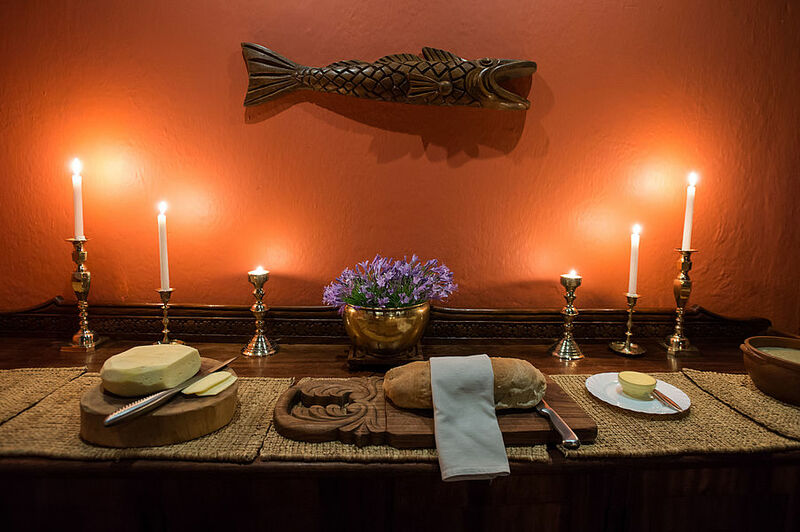 The ultimate comfort food. Our vegetables and herbs are picked daily from the organic garden. 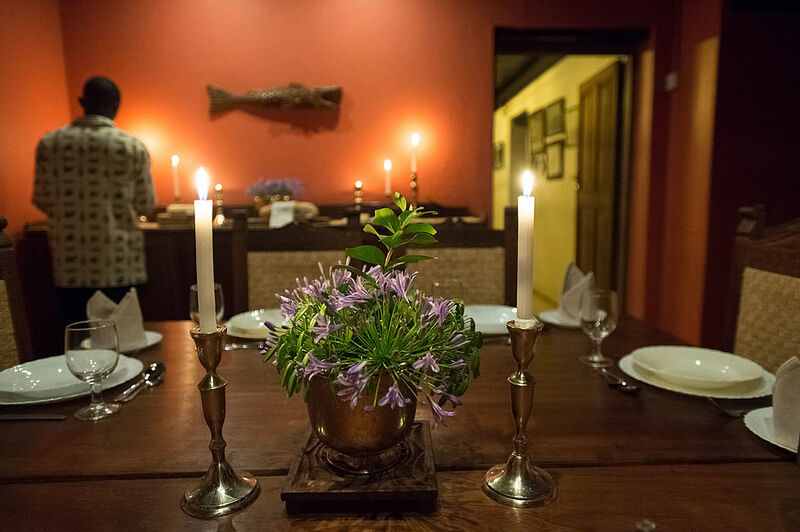 Contact us in advance to book a dinner or a sunset drink. 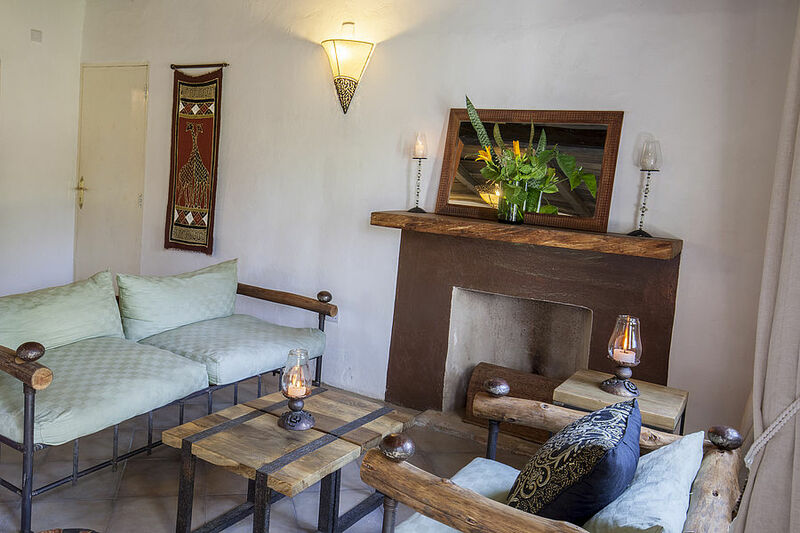 Aside from a notable beverage collection our Bar offers a healthy juice list. Enjoy our main dining room with the veranda towards the croquet field. You can also have your meals in the outdoor dining facilities with a fireplace and beautiful view on the forest and lake. 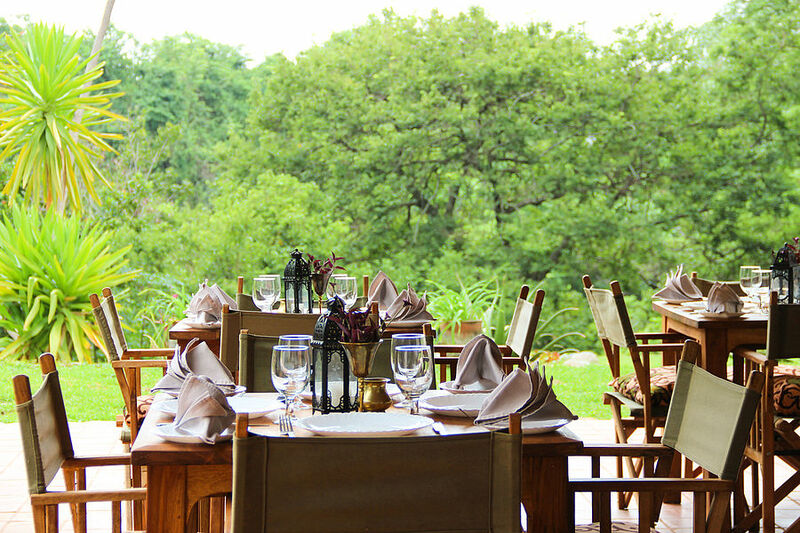 For special events or a more private and romantic setting we are happy to arrange your dinner in our lake pavilion. 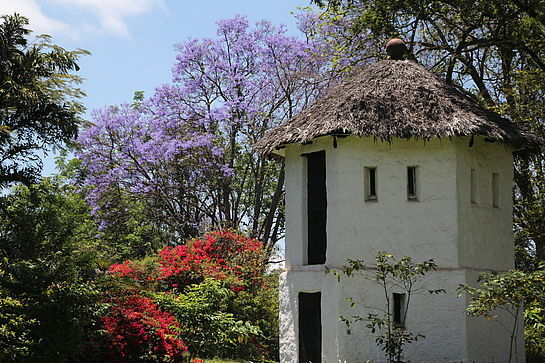 There you can enjoy the secludedness of the african tropical gardens and a wonderful view on the lake. JUA KALI is a name of the village next to Ngare Sero Lodge on the green slopes of Mt Meru. 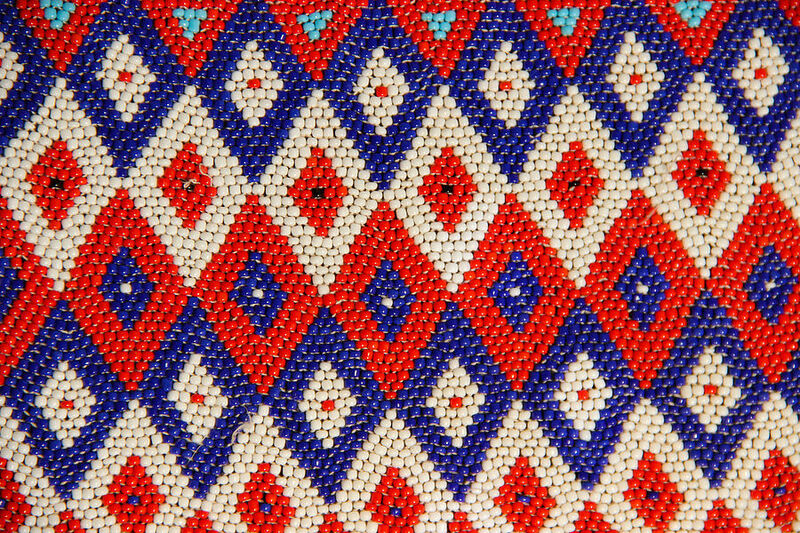 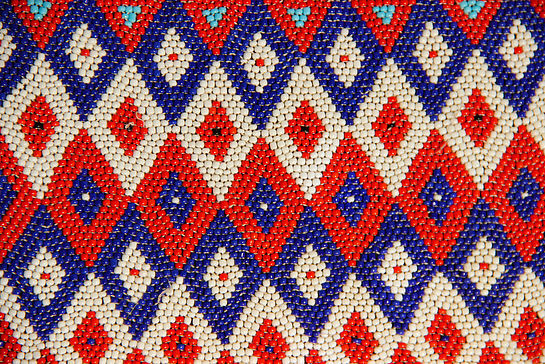 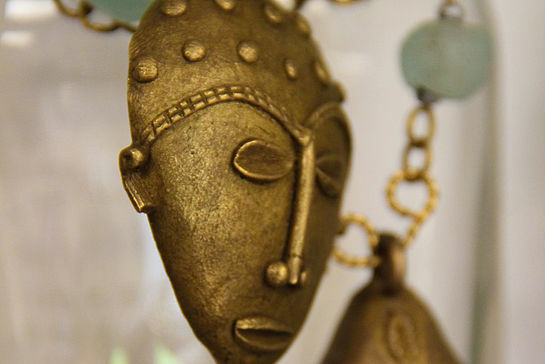 It is translated as “the hot sun” from Swahili, but it also means resourcefulness, an ability to create something out of whatever is available. 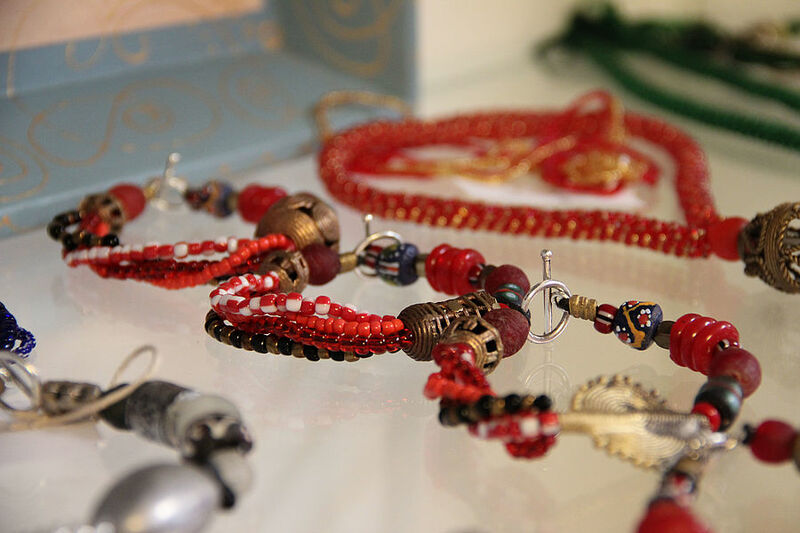 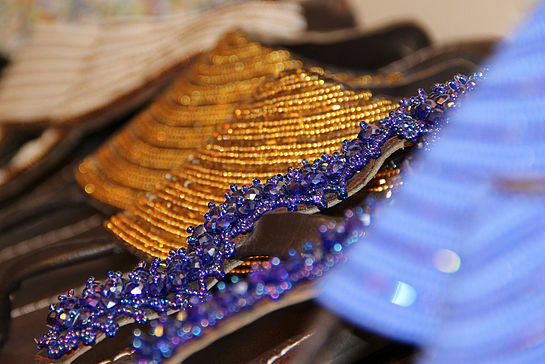 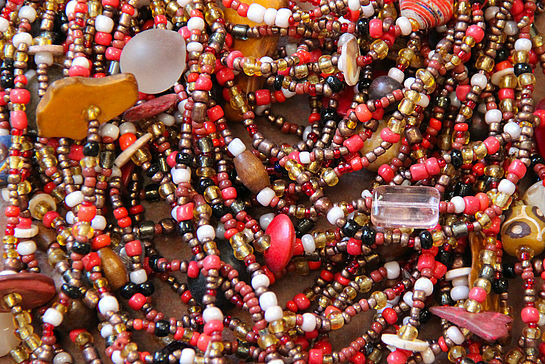 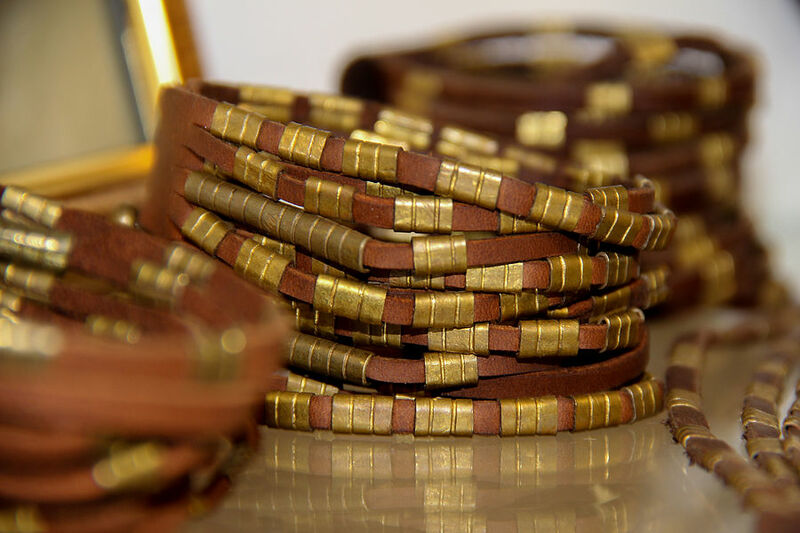 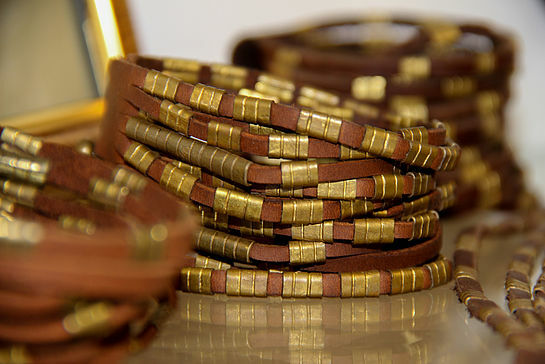 JUA KALI is a crafts boutique supporting local artisans – carvers, jewelry-makers and tailors, which aims to promote recycling and introduce new skills into the community. It also represents eco-friendly and responsible businesses all over Tanzania. 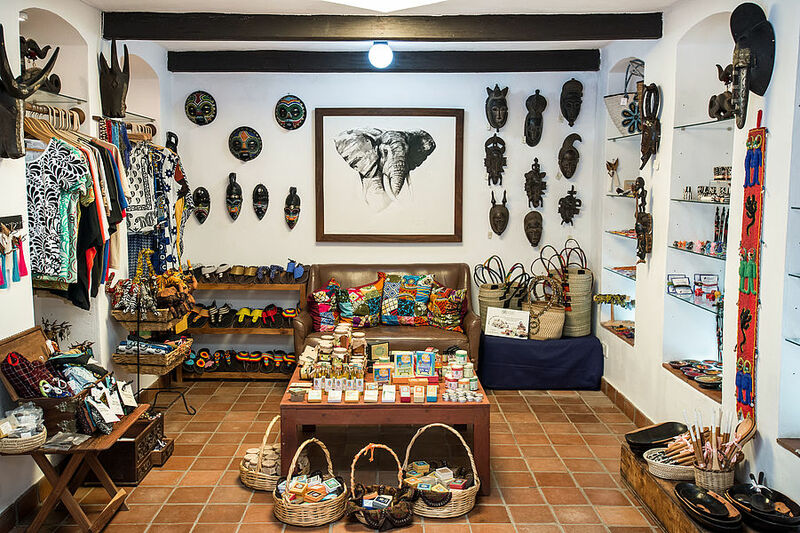 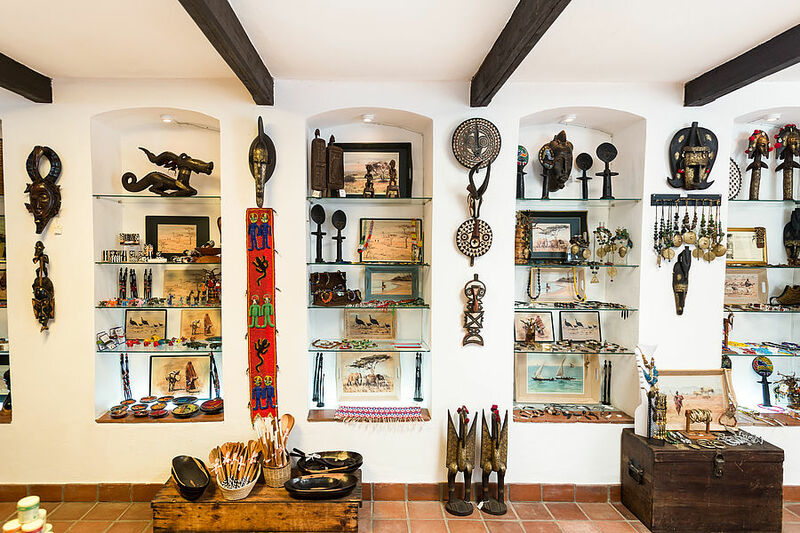 Weather you are about to go on safari and would like to purchase your last minute supplies or looking to buy responsible gifts for your loved ones, visit our JUA KALI CRAFTS boutique which offers souvenirs, conveniences, toiletries and books. 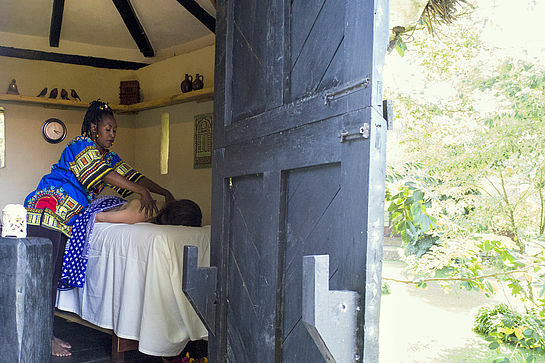 After long hours spent in the car or plane enjoy any of our realxing massages. We use natural body oils and provide you the luxury of a massage amid lush gardens of heliconia and bougainvilea. 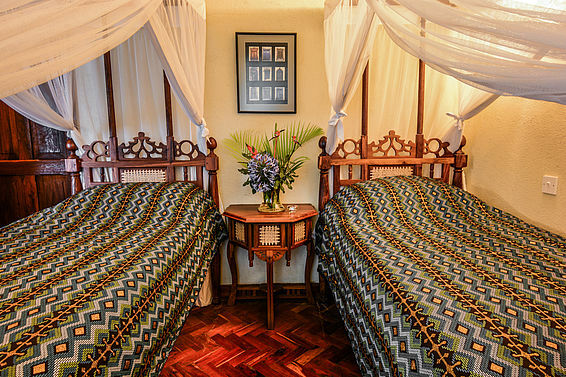 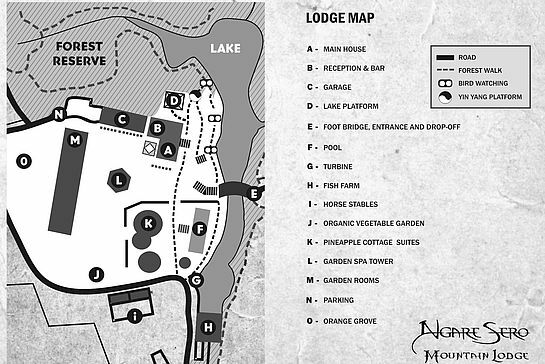 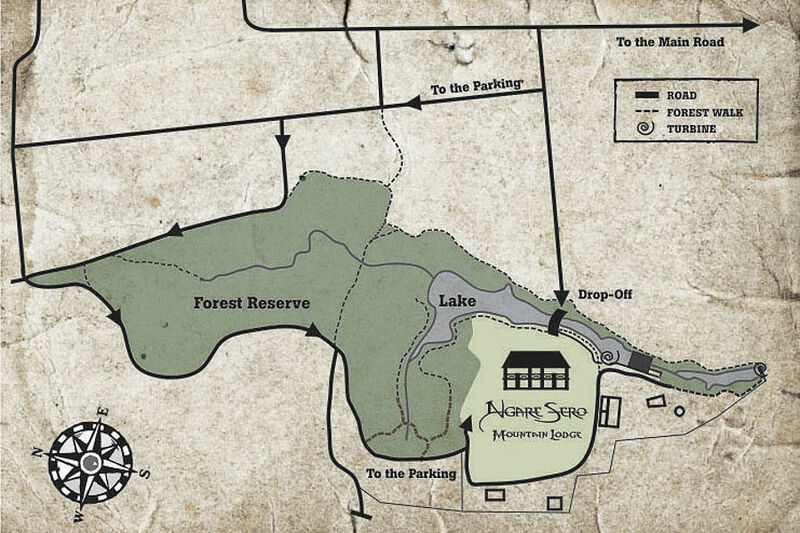 Ngare Sero Mountain Lodge is situated at the lake surrounded by 50 acres of forest reserve. 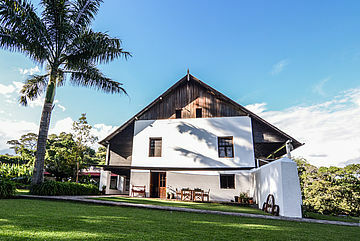 Numerous bird and small animal species inhabit this unique eco-system. 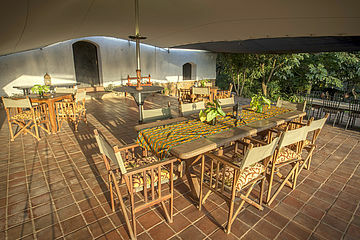 We offer guided and independent nature walks for our guests. To learn more see our Activities page.